The four etchings presented highlight the visionary skill and technical mastery of the painter and printmaker James McNeill Whistler (1834 – 1903). While an American by birth, Whistler spent the majority of his life and career in Europe — primarily, in England. Whistler first learned to etch in 1854 while employed by the Drawing Division of the U.S. Coast Survey Office, which produced detailed maps of the U.S. coastline; later in the decade Whistler began to devote himself seriously to the medium. The artist etched on plates directly from nature, and he typically completed the proofing and printing of the etchings himself. Whistler believed “that in etchings, the means used, or instrument employed being the finest possible point, the space to be covered should be small in proportion.” While his etchings remained modest in size, Whistler’s innovation in the medium rendered him one of the most important etchers in the Western tradition. He produced more than 450 etchings in an oeuvre that includes paintings, watercolors, pastels, drawings and lithographs. The first Whistler etching to enter the UAMA collections was Annie, a gift from C. Leonard Pfeiffer in 1946. 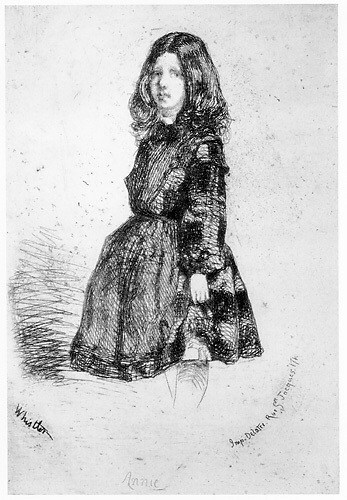 One of the artist’s earliest etchings, Annie (1857-8) portrays Whistler’s nine-year-old niece, Annie Haden. Another early etching, Black Lion Wharf (1859), was part of a successful series of etchings called the Thames Set that launched Whistler’s reputation as an etcher. Both Sketch of Ships and Exeter Street also depict views from Whistler’s London environs — the former a scene along the Thames River, and the latter an impressionistic rendering of a storefront in Chelsea.